Sensoria, a wearable fitness maker, understands that whatever form fitness trackers take, they need to be readily wearable. I've seen several different kinds of fitness trackers; some are easy to wear and others require a lot more extra effort than should be expended. 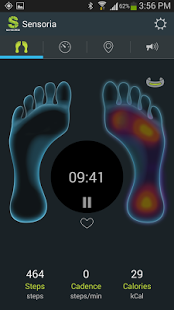 Sensoria, meanwhile, made a splash when it put its fitness tracking systems in socks. Now it's stepping up its line to cover the upper body. The new Sensoria line goes beyond the sock to include a sports bra as well as a new T-shirt, providing different experiences for different runners. Both bra and T-shirt come with a line of built-in electrodes to measure heart rate, and are made of moisture-wicking fabric to help keep body temperature fluctuations down to a minimum for more accurate measures. The heart rate sensors, meanwhile, have also been improved for better comfort and accuracy. The sports bra, the T-shirt and the socks will reportedly connect back to the Sensoria Fitness mobile app, where real-time feedback about the whole running performance can be assessed. This means a better chance at improved performance and a reduced chance of injury in the process. Even the app has received something of a facelift, and can now be found on the Google Play store as it's an Android app. The new app has improvements to the Virtual Coach and Shoe Closet functions, as well as a new user feedback form. Those interested in the new Sensoria line can purchase today; the sports bra is available for $139 with the heart rate monitor and $69 without. The T-shirt, meanwhile, is $149 with the monitor and $79 without. But for those with a wider interest in the wearable technology market, it's a good time to book a trip to Las Vegas. Specifically, Caesars Palace, Las Vegas, as it will be host to the Wearable Tech Expo running August 18 – 20. While at the event, attendees will have the opportunity to see a host of technology companies' developments, as well as hear addresses from a variety of industry figures like Lycos' Suresh Reddy. This not only allows the attendee to get a handle on where wearable tech is right now, but where it's likely to be in another few years. Sensoria has a pretty impressive offering right now; having used some fitness trackers that require chest harnesses and moistened sensors, something as easy as a pair of socks or a T-shirt sounds appealing to me. The easier something is to use, the more likely it will become a habit—which is the ideal outcome of a fitness push. Sensoria's systems look to support just such a habit in the making. It's not easy to get to the point where that happens, and anything that helps will likely prove welcome. In the end, Sensoria has a very exciting proposition here, and one that's likely going to help get some users up off the couch and out onto the track, road or trail in to drive fitness and improve one's life overall.